It is with great this months News has been written by our friend Niall who came to spend some time with us some years ago and who returned in August. It is so lovely to know how much people love our project, and the staff are so happy when people come back to see them. Niall’s letter includes something about the Rwanda Rocks project, a new partnership for us. I went there yesterday with the children and have added some photos. I am very excited about this – anyone who knows me well knows just how much I love working with music with children. I will be meeting Mary, the founder of the project in November. Hopefully we will be able to do even more together. I also enclose an article that appeared in the Mendip Times. We were very happy to hear that Friends of Rwandan Rugby were returning, and from that visit we have a friend, Duncan, who will be returning himself next year. We are lucky in our friends. As I’m sure all volunteers will attest, when you aren’t in Rwanda, you miss it. It is such a wonderful and beautiful country so it was inevitable that I would eventually find my way back to Kigali. Finally that day came this summer. Back in 2011 I went along to Kinamba project for 3 months. While I was there I helped teach an adult English class. It was a challenging but incredibly enjoyable time where I was lucky enough to become a member of the Meg Foundation family and I was able to help some incredibly talented Rwandans learn English. Returning to Kigali was a strange experience, on first look it seems that the last 5 years have been characterised by rapid growth. Once you get out of Kigali Town, the unrecognisable economic centre of the city where anything old or small has been replaced with a tower complete with roof bar and posh coffee shop you get to see that growth has not had quite the same velocity for the people of Kigali. Coffee, still a major export for Rwanda, is still not something that the average Rwandan can afford. Poverty still lives in Kigali and lots of work needs to be done for this city to boast a great skyline and a well prosperous population. My next stop after Town was Kinamba, just a short walk from town, on the side of a hill. I was excited to see the school and the friendly faces within. Structurally there have been two big changes since I was last at the school. An old storage area has been converted into a new classroom. Space at the back of the school has seen another new classroom erected also. Luckily there haven’t been many staff changes either as many of the teachers remain. So I felt at home immediately. I made sure on my visit to get myself in to some lessons and see how teaching is being delivered; my first stop was in to the classroom of nursery 2A taught by a young teacher called Claire whose energy and passion had been what I’d remembered of her teaching when I was last at the Meg Foundation. I was bowled over by the quality of the session as Claire had refined her skills and presented a wonderfully structured session teaching the children about the letter B. The standard of teaching at the Meg foundation has always been very high thanks to the experience of Meg and the many volunteers who have come to support the teachers with extra training, but from my experience in all of the sessions I watched on my visit it feels like even more improvement have been made. One of the areas that amazed me was the increase in the depth of the curriculum. 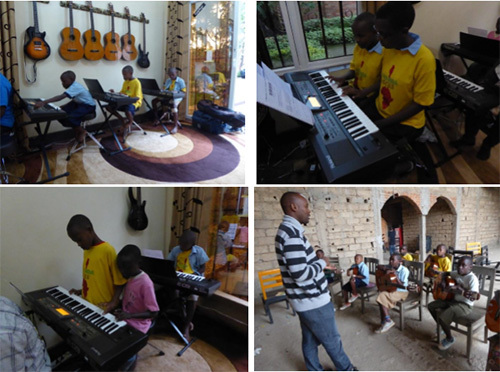 One of the great steps the school is currently taking is partnering with Rwanda Rocks, an initiative trying to bring music lessons to children in Rwanda who would generally not get such an opportunity. 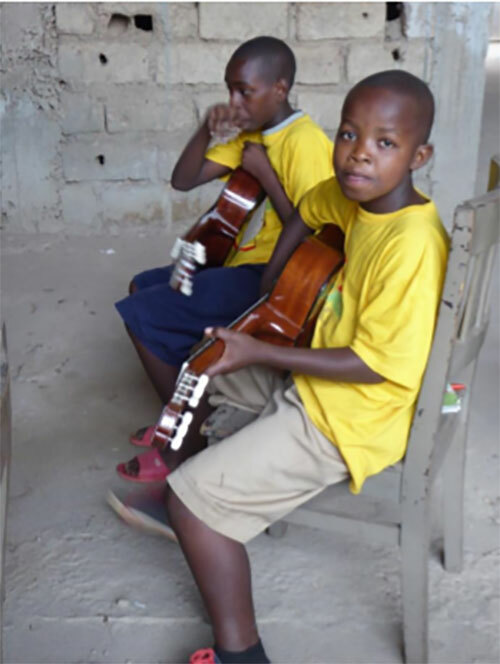 I was lucky enough to attend a guitar lesson when some of our primary students were taught by a local musician, many of the kids started the lesson having never touched a guitar, they ended it already being able to play 2 chords. They’ve got nine more weeks of practice with Rwanda Rocks; I’m looking forward to seeing the first Meg Foundation Rock band forming. My visit this time was only a short one so I’m now back in the UK. I hope not to leave it so long next time. This is a new partnership for us; Rwanda Rocks has been set up by an inspirational lady from Los Angeles. I hope to meet her in November and I also hope we will be able to support those children with talent to develop their music.